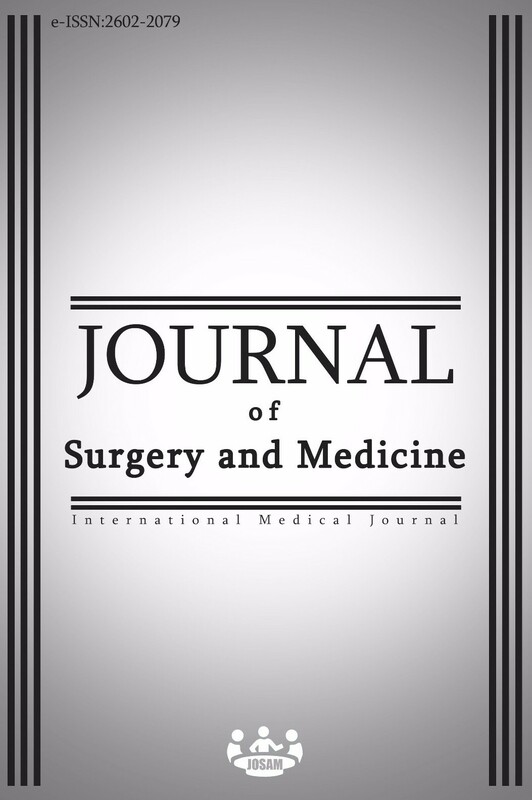 Journal of Surgery and Medicine (JOSAM) is an open access, international scientific journal with independent, unbiased, and double-blind review under international guidelines. The aim of JOSAM is to contribute to the literature by publishing clinical and experimental studies (research article, review and case reports). The journal is published monthly (last week of every month). Publication language of JOSAM is English. Processing and publication in the journal are free of charge (No article processing or submission charge). Fast-track process is reserved for urgent leading and invited articles. Please look the latest lay-out style of the journal at published articles in early pub issue. JOSAM is indexed in CrossRef (DOI), International Scientific Citation Index (ISCI), Academic Keys, International Society for Research Activity (ISRA), ResearchBib, International Scientific Indexing (ISI), Directory of Research Journals Indexing (DRJI), International Institute of Organized Researches (I2OR), Science Library Index, Journal Factor, scientific World Index (SCIWIN), General Impact Factor, Journal Impact Factor (JIFACTOR), Scientific Indexing Service (SIS), J-Gate, Rootindexing, SHERPA/RoMEO, COSMOS IF, International Committee of Medical Journal Editors (ICMJE), SOBIAD, ROAD. International Advisory Editorial Board members are added. JOSAM is indexed in Google Scholar, SciLit, Directory of Open Access Journals (DOAJ), Türk Medline, JournalTOCs. When to apply propess to provide the best activity: In the morning or evening? Original Social Media accounts are listed here. We have no interest with other unrelated accounts. JOSAM is hosted by TUBITAK DergiPark, and is licensed under a Creative Commons Attribution-NonCommercial-NoDerivatives 4.0 International License. To use the submission system properly, please use one of the following browsers, Chrome or Firefox, with the latest updates. If you experience problems, it may be necessary to clear the browser cache and history. Mobile phones are not recommended, please use personal computer.